A sparkling Champagne punch can add elegance and flair to any party. These type of recipes are quite diverse and often show off the best fruits of the season, which adds to the refreshing taste. Whether you're hosting an intimate brunch or a big celebration, there's sure to be a punch your guests will love. So, break out the bubbly and let's mix up some great drinks for everyone to enjoy! With a pomegranate and cranberry juice base, this Champagne punch is a guaranteed crowd pleaser. It's a remarkably simple recipe and one that can be customized for parties in any season. This one gets a little boost from a cup of citrus vodka and a few tablespoons of cinnamon syrup. That version is fantastic for autumn and winter affairs, and a quick switch to a lavender syrup would make it ideal for spring and summer. You will find many Champagne punch recipes that feature strawberries. It's the ideal fruit because it pairs perfectly with sparkling wine. There's no need to wait for strawberry season with this recipe, either. The strawberry Champagne punch is a pure delight and it's super simple. You'll need a frozen fruit punch and strawberries, along with orange juice. It doubles up on the bubbles, mixing in both Champagne and ginger ale to create a very enjoyable drink. The cranberry elderflower Champagne punch puts a floral spin on the typical fruity mix. It gets the sweet taste of elderflowers with a few ounces of St. Germain liqueur and it's quite a lovely blend. For this recipe, the elderflower is paired with cranberry. You can easily give it a lighter profile by pouring white cranberry juice instead of the typical red. It also adds a light soda to enhance the sparkle. You will only need four ingredients for the Rosé berry bliss punch and it can be mixed up just an hour before serving. It's a delightful drink and the recipe is perfect for brunch or a small celebration. The recipe combines frozen blueberries and pink lemonade to give it a lively flavor profile. Add an impressive sparkling Rosé and some lemon-lime soda and consider your party drinks done. If you're seeking a sparkling punch that is extraordinary and unique, the apricot sunray is a perfect choice. It's a completely different profile than most of these recipes and sure to surprise your guests. The recipe combines a nice Cognac with a dry sparkling wine, but it's the fruity layers that make it really interesting. ​Apricots are the star of the show, appearing as a liqueur, nectar, and fresh fruit. 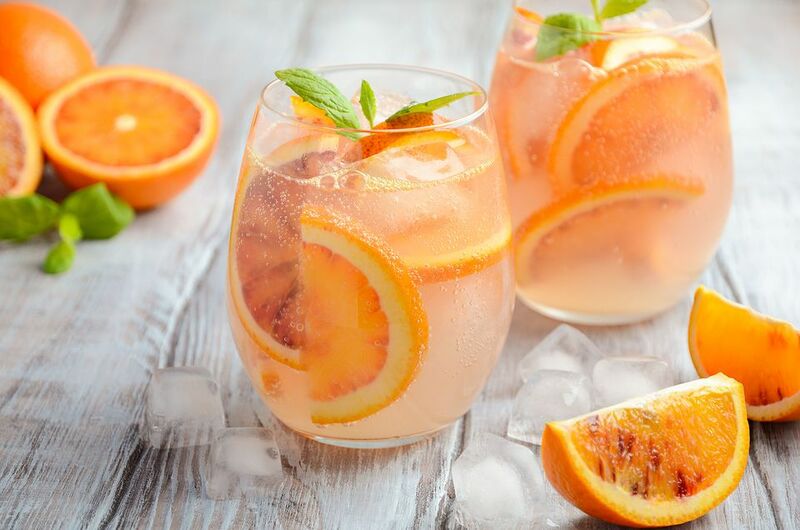 Add blood oranges, lemons, and brandied cherries and you have a very fun mix. Erdbeerbowle is German for "strawberry punch" and this recipe is an excellent use of the fresh berries. 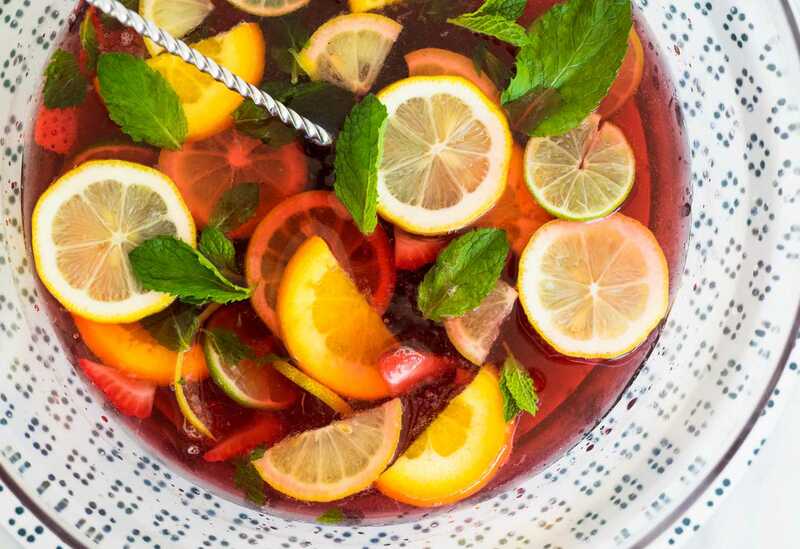 It's a favorite punch for summer barbecues in Germany and simple enough for any casual gathering. Two quarts of freshly picked strawberries are combined with sugar and lemon juice to create the base. Let that marry for two hours, then add a full bottle each of sparkling and dry white wines. A great drink really is that easy! Are you thinking a little whiskey may be good for your party? The Jim Beam fruit punch is just the recipe you need. It features Red Stag, the bourbon icon's cherry-flavored whiskey and it's a lot of fun. For this recipe, the flavored whiskey is paired with strawberry liqueur and passion fruit juice to give it an interesting fruit flavor. Just before the party's set to begin, top it off with your favorite Champagne and enjoy. Strawberries are great, but strawberries with pear and basil are even better. That's what you'll find in the sparkling strawberry rosé recipe. It's one you can taste for yourself before mixing up the larger batch and a great way to show off a few homemade ingredients. This intriguing mix begins with a strawberry vodka paired with a sweet pear nectar. It gets a little sour from lemons and some sweetness from a homemade basil syrup. Finish it off with a sparkling Rosé and let the party begin. Add a pop of color to your punch table with the electric green Midori berry bliss recipe. It's one that you can make as a single glass, a pitcher for a few people, or a full punch for a crowd. No matter how much you mix up, it's sure to please. As you might suspect, the punch includes Midori, that popular bright green, melon-flavored liqueur. That is mixed with vanilla and raspberry vodkas as well as pineapple juice. While soda can be used, we really like it with Italy's prosecco. The mimosa is the ultimate Champagne cocktail and a favorite for brunch. Give that classic a tropical twist and serve your guests pineapple mimosas instead.